Russian manned space station. Study 1960. In 1960 Korolev proposed a military orbital station (OS), with a crew of 3 to 5, orbiting at 350 to 400 km altitude. Status: Study 1960. Gross mass: 30,000 kg (66,000 lb). The station would conduct military reconnaissance, control other spacecraft in orbit, and undertake basic space research. This initial OS grew into the much larger TKS concept of 1961. Korolev would not obtain a positive response to this proposal. As the N1 launch vehicle design grew, this initial OS grew into the much larger TKS of 1961. TKS Heavy Space Station Russian manned space station. Study 1961. The TKS (Heavy Space Station, also known as TOSZ - Heavy Orbital Station of the Earth) was Korolev's first 1961 project for a large N1-launched military space station. OP Russian manned space station. Study 1962. Korolev's next attempt to win military support for development of the N-I was his fantastic 'Orbitalniy Poyas' (OP -Orbital Belt) scheme of 20 April 1962. OS-1 (1965) Russian manned space station. Reached mock-up stage, 1965. OS-1 (1969) Russian manned space station. Study 1969. By 1969 the giant OS-1 space station had evolved to this configuration. MKBS Russian manned space station. Cancelled 1974. The culmination of ten years of designs for N1-launched space stations, the MKBS would be cancelled together with the N1. OS-1 Lunar Russian manned lunar orbiter. Study 1969. A version of the OS-1 station was proposed for use in lunar orbit. No other details beyond this sketch. Family: Soviet Space Stations, Space station, Space station orbit. Country: Russia. Launch Vehicles: N1, N1 1969. Agency: Korolev bureau. Bibliography: 283. Korolev tries to obtain support for a military orbital station - . Nation: Russia. Related Persons: Korolev. Spacecraft: OS. Korolev wrote to the Ministry of Defence, trying to obtain support for a military orbital station (OS). The station would have a crew of 3 to 5, orbited at 350 to 400 km altitude. The station would conduct military reconnaissance, control other spacecraft in orbit, and undertake basic space research. The N-I version of the station would have a mass of 25 to 30 tonnes and the N-II version 60 to 70 tonnes. Korolev pointed out that his design bureau had already completed a draft project, in which 14 work brigades had participated. 1961 May 3 - . Launch Vehicle: N1. The draft project of the TKS Heavy Space Station was completed - . Nation: Russia. Related Persons: Korolev. Spacecraft Bus: OS. Spacecraft: TKS Heavy Space Station. Also known as TOSZ - Heavy Orbital Station of the Earth, this was Korolev's first 1961 project for a large N1-launched military space station..
1962 April 20 - . Launch Vehicle: N1. OP -Orbital Belt - . Nation: Russia. Related Persons: Korolev. Spacecraft Bus: OS. Spacecraft: OP. Korolev's fantastic 'Orbitalniy Poyas' (OP -Orbital Belt) scheme anticipated Ronald Reagan's Strategic Defence Initiative by 25 years. Two to three large N-I launched military manned stations would control a constellation of strategic assets. Geosynchronous nuclear-powered satellites would provide secure communications. Piloted reconnaissance spacecraft would surprise the enemy, observing military preparations without warning. The orbital stations would provide continuous observations of the territory of the imperialist block. 1962 September 25 - . Launch Vehicle: N1. N1 launch vehicle upgraded to accomodate OS-1 75 tonne manned platform with nuclear weapons. - . Nation: Russia. Related Persons: Khrushchev, Korolev. Class: Earth. Type: Weather satellite. Spacecraft Bus: OS. Spacecraft: OS-1 (1965). Work on the OS-1 began following a meeting between Khrushchev and chief designers at Pitsunda. Korolev was authorized to proceed immediately to upgrade the three stage N vehicle to a maximum 75 tonne payload in order to launch the station. By 1965 the mockup of the huge station had been completed. 1967 February 14 - . Launch Vehicle: N1. Fairing for OS space station authorised. - . Nation: Russia. Spacecraft Bus: OS. Spacecraft: OS-1 (1969). Ministry of General Machine Building (MOM) Decree 'On construction of the N1 payload fairing by the Khrunichev Plant' was issued..
1972 February 23 - . LV Family: N1. Launch Vehicle: N1F. MOK technical proposal authorised. - . Nation: Russia. Spacecraft Bus: OS. Spacecraft: MKBS. Decree 'On work on the technical proposal for the creation of the MOK' was issued..
Multi-module Orbital Complex (MOK) designed - . Nation: Russia. Spacecraft Bus: OS. Spacecraft: MKBS. 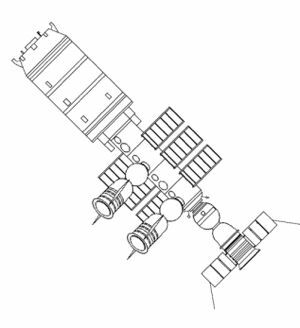 In the second half of 1972 and first half of 1973 TsKBEM began technical development of a Multi-module Orbital Complex (MOK). MOK was not a single spacecraft but an integrated collection of earth-based and near-earth orbital systems consisting of the Multi-module Cosmic Base Station (MKBS); autonomous spacecraft, operating from the MKBS; and logistics systems (expendable and reusable launch vehicles, interorbital tugs, earth launch sites, etc). MOK was dependent on the N1 launch vehicle, and was abandoned when this was cancelled in 1974.